"Carson Gulley, Madison’s first celebrity chef" - an excerpt hosted at Recollection Wisconsin. "I recommend reading it while nibbling on a morning bun or a slice of fudge bottom pie." "Expect ditties that add a rich historical perspective to the city’s culinary scene." "Really fun & illuminating (w/ beautiful photos!)" 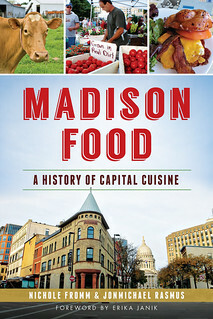 "While this is not a systematic history of dining in Madison, there is much good information about legendary and not-so-legendary eateries of the past and present."